Air Canada is flying high these days, as it continues to expand its global network. Top executives from the carrier were in Toronto last night (May 24) to celebrate with their travel agency partners, the launch of four new routes to destinations in Argentina, Croatia, Portugal and Romania. The new, non-stop routes include Toronto-Buenos Aires; Toronto-Zagreb; Toronto-Porto; and Toronto-Bucharest. About 160 top travel trade types also had the chance to meet Air Canada’s new vice-president, global sales and alliances, John MacLeod. Addressing the gathering, MacLeod praised Duncan Bureau, who is now president of Air Canada Rouge, for his work building strong partnerships with the travel agency community as well as a strong sales team at Air Canada. And MacLeod made it clear that he looks forward to working with the carrier’s agency partners and continuing to strengthen that relationship. He pointed out that Air Canada’s goal is to be a top 10 global airline and it needs the support of its agency partners to achieve that goal. In talking about its new routes and its network expansion, Air Canada’s senior director sales, Canada, Virgilio Russi told the audience that since 2016, the airline has launched 74 new, international routes and increased its capacity by 40% and there’s more to come – so stay tuned. 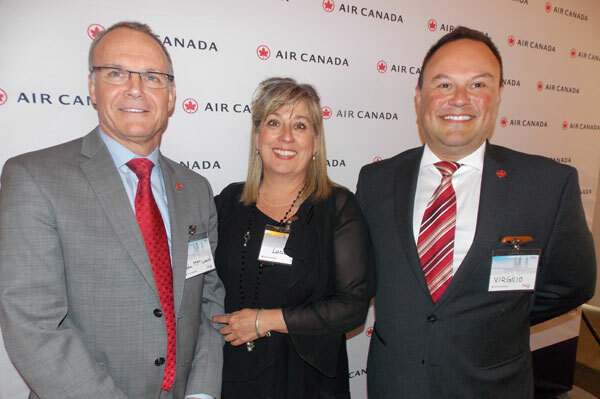 Seen in the photo, from l to r, are Air Canada’s vice-president, global sales and alliances, John MacLeod; Air Canada’s executive vice-president & chief commercial officer, Lucie Guillemette; and Air Canada’s senior director sales, Canada, Virgilio Russi.